Don’t want to indulge yourself in the mainstream, crowded study spots? Have an awkward amount of time in between classes? Finding your own niche on campus can be a daunting task, from friendships, clubs, even to study spots. I somehow found my study spot stumbling around the ever so confusing Educational Sciences building. Don’t be turned off because ofthe unlucky number,it may become one of your new favorite spots too. The 13th floor of the Educational Sciences building is what I would consider a hidden gem. The elevator doesn’t even go up to there, you gotta take thegood oldfashioned stairs from the 12th floor. I found this little spot after a class in Educational Sciences, and with the ever so awkward hour gap between classes, needed a place just to chill for a bit. Since then, it has become my go to, if I need a few minutes to relax in peace, eat a quick snack, or crack down on the studying. During finals week, it served me and a few friends extremely well, when the library was in overflow mode. With floor to ceiling windows covering all the walls, the view is endless. 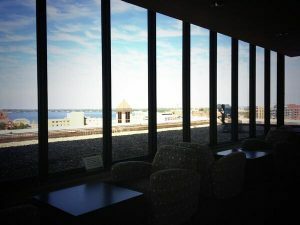 You can look out for miles onto all areas of Madison. There are comfy chairs to lounge in as well as tables to spread out at. It’s never too crowded, and for whatever it is you need, always the place to sneak away too. Here’s to keeping the 13th floor a (kind of) best kept study spot secret.